Augmentative and Alternative Communication (AAC) is the official journal of the International Society for Augmentative and Alternative Communication (ISAAC). 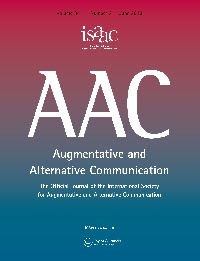 AAC publishes scientific articles related to the field of augmentative and alternative communication (AAC) that report research concerning assessment, treatment, rehabilitation, and education of people who use or have the potential to use AAC systems; or discuss theory, technology, and systems development relevant to AAC. Research articles, including intervention and technical notes (full peer review): Research articles report the results of empirical research, including studies using qualitative and quantitative methodologies, both group and single case research designs (e.g., McNaughton, Rackensperger, Benedek-Wood, Krezman, Williams, & Light, 2008; Petroi, Koul, & Corwin, 2014; Binger, Kent-Walsh, Berens, Del Campo, Rivera, 2008). Technical, research, and intervention notes (full peer review) are brief manuscripts (20-25 pages maximum) that address methodological, statistical, technical, or clinical issues or innovations that are of relevance to the AAC community and are designed to bring the research community’s attention to areas that have been minimally or poorly researched in the past (e.g., Beukelman & Ansel, 1995; Creak, 1996; Ferrier, Fell, Mooraj, Delta, & Moscoe, 1996; Salamo & Jakobs, 1996). Systematic research reviews and meta-analyses (full peer review): These papers identify, select, synthesize, and appraise all high quality research evidence relevant to a particular research question and consider implications for evidence-based practice and directions for future research (e.g., Walker & Snell, 2013). Tutorials (full peer review): This type of manuscript explains theories, ideas, concepts, or practices that may be new to AAC researchers and practitioners, but have important implications for the field (e.g., Venkatagiri & Ramabadran 1995). Forum papers (full peer review): Forum papers include discussions of innovative topics that are relevant to the field of AAC. Typically, they consider research and practice in other fields and discuss potential implications for AAC (e.g., Mirenda, 2014; Soto & Yu, 2014; Wilkinson, Light, & Drager, 2012). Case studies (full peer review): Case studies report the results of innovative AAC applications that were not conducted within the confines of a rigorous research design but which provide a clear description of all aspects of the intervention process and provide data documenting outcomes. The case study should have important implications for future research, program development, and/or intervention (e.g., Odom & Upthegrove, 1997; see also McEwan & Karlan, 1990 for case study guidelines).